For the modern woman of today who simultaneously likes the touch of a tradition, this is Lakme Jewel Sindoor. A liquid-based sindoor that allows precise application and comes in two classic shades –red & maroon. Giving that finesse with a sponge tip applicator, this symbolic tradition is now a non-messy affair. Step 1- Open the cylindrical cap and remove the excess product on the edge. 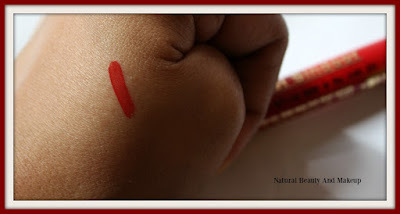 Step 2- With a steady hand apply the sindoor on your forehead, at the beginning of your hairline. 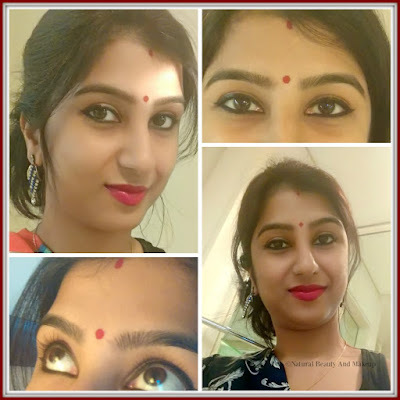 Lakme is our very own Indian cosmetic brand and till date, I have tried a lot of makeup products from them. Some products satisfied me while a few not! 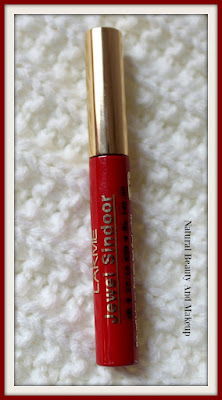 Lakme has two variants of Liquid Sindoor – red and maroon. 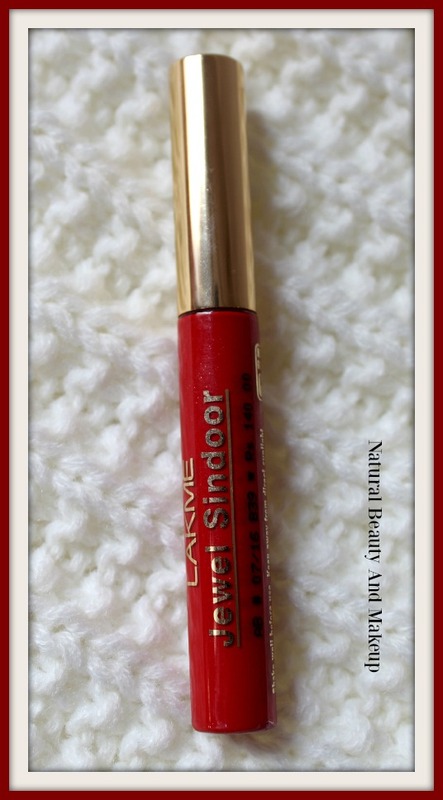 I love red shade so chose it over maroon and as mentioned, today’s review would be about this red sindoor. Lakme Jewel Liquid Sindoor (Red) is a cool-toned pretty red colour sindoor with no glitters. I assumed it would contain golden shimmers having the name Jewel in it but no, it’s free of sparkles. Major plus!! It has no artificial fragrance and has quite a runny consistency with a smooth texture. I do prefer applying liquid sindoor mainly at the centre, the starting point of my hair parting line and not along the entire length. 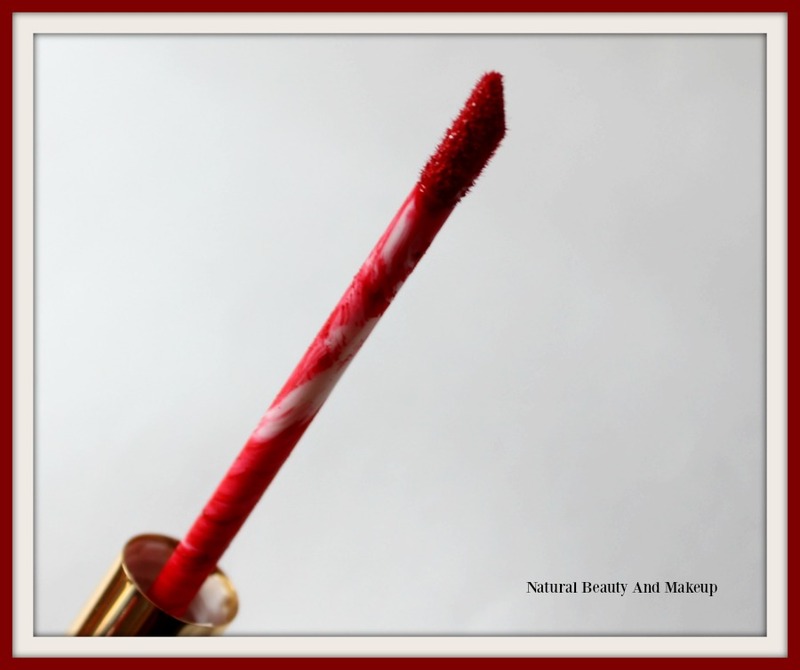 The sponge applicator comes so handy to work with that you can easily create a simple line, triangle shape design or even a circular bindi (dot) on the middle of the forehead! The thin, runny consistency of this liquid sindoor provides an effortless application 😊 After you apply it on the skin wait for few seconds and let it dry. Once it dries, it settles into a matte finish which does not budge for a good period of time. It is water resistant but not completely waterproof and can be easily removed by any makeup remover or simple Vaseline. The ingredients list is missing! No glitters, at least not visible through my naked eyes! If you are interested in sparkling sindoor, it’s not the one. In a nutshell, I love this Lakme Jewel Liquid Sindoor for its non-messy and easy to apply features besides its gorgeous red shade! However, I would appreciate if Lakme discloses its ingredients list on the packaging itself or at least on their official website. 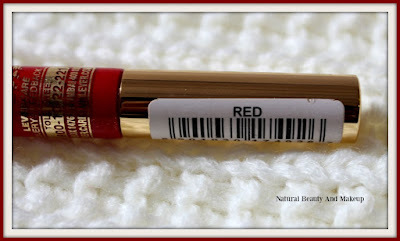 I may not be repurchasing this product as I am willing to try other brands as well! 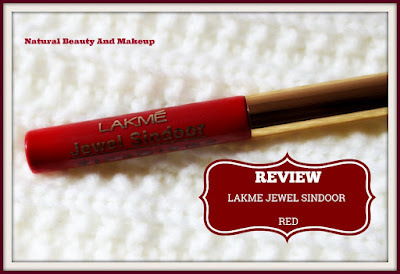 Have You Ever Tried Lakme Jewel Liquid Sindoor In Red Shade? Do Let Me Know Your Favourite Sindoor In The Comment Section Below! I would love t but this one..
That red dot is my pride and proud moment as well. This is good. Not drippy, hopefully won't drip when I sweat profusely in our blistering sun which we are currently struggling with. Thank you Nava Ji :) It's matte and doesn't smudge easily, so you can try this! Thanks a bunch, dearie <3 Yes, it's highly pigmented! I love red so much, this is perfect!!! The red color is so bright and perfect red. I will buy this. I haven't tried Lotus Sindoor, will buy it next :) Thanks for recommending it sweety <3 Thank you!